The movie rental kiosk service Redbox has filed a lawsuit against Disney's home entertainment division, claiming the studio is using "hard-knuckle tactics" from preventing the rental kiosk from renting or selling its popular titles including the Star Wars and Marvel movies. Most recently, Disney has also tried to stifle the sale of digital downloads of Disney movies. Here's an excerpt from the lawsuit below, which was filed Friday in federal district court in Los Angeles. "Disney baldly seeks to stifle competition and eliminate low-cost options in order to maximize the prices it and its retailers charge consumers. Stopping Redbox's sale of Disney products is a means to that end, which is an unhappy one for consumers." 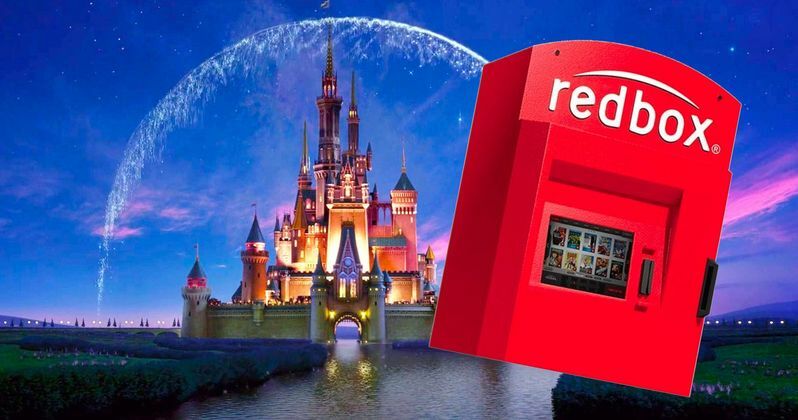 The lawsuit alleges that Disney has opposed the Redbox rental kiosk service from the very beginning, and it's not surprising that they're challenging them now, with the studio launching a new Disney streaming service that should be ready to launch sometime in 2019. Redbox claims that Disney's home entertainment division, Buena Vista Home Entertainment, claimed Redbox's prices were too low. Disney wanted their titles to only be available to Redbox customers 28 days after its initial release, which Redbox refused to accept. Instead, Redbox ended up purchasing the discs themselves at full retail prices, including combination packs of DVDs or Blu-rays that were paired with Digital HD codes Redbox would then sell themselves, along with renting the discs. Disney has even tried to sue Redbox to prevent them from selling these digital downloads. Here's another excerpt from this lawsuit below. "Defendants' actions are harming Redbox's lawful sales of Disney digital movies. And the impact of that harm is not limited to the reduced revenue from those lost sales. Redbox's entry into the digital market is being harmed as well. Because Disney is impeding Redbox's ability to sell Redbox's lawfully acquired Disney digital movies, consumers are being dissuaded from looking to Redbox as a source of titles that are in high demand." Redbox claims that Disney has also put pressure on other distributors to cut ties with Redbox. The studio even reduced one distributor's allotment of Disney titles upon learning that they had been a major Redbox supplier. Disney even reduced one distributor's allocation of Disney titles when it learned that the company had been a major Redbox supplier. Both Star Wars and Marvel movies are said to help launch this Disney streaming service in 2019. You can head on over to Deadline to learn more about Redbox's new lawsuit against Disney.